Hitchcock and Landers are also both in contention for the Winter Pairs League title with their respective team-mates, while Danny Cramphorn and his partner were successful in the Bob Adie Classic with 44 points. Jim Wallis and Ruth Sleigh completed their respective terms as the men’s and ladies club captains at Cold Ashby as they handed over the reins to George Sharp and Anne Hopwell. The 10-hole Greensomes Stableford which followed the Captain’s Drive-In was won by Richard Martin and Tommy Dolman on countback from Vince Thomas and Lyn Thomas. Scoring once again proved tricky during the latest two rounds of the Tigers Winter League as no-one managed to beat their handicap in the cold and wet conditions. Steve Trotman’s 35 points were enough to win the ninth round by one from Peter Sadler, while Bob Thomson (36) took the 10th round plaudits by two points from Peter Bosworth, Thomas Haydon and Stuart Metcalf. Ten gross pars were on the winning scorecard of Mark Hemmings in the January Stableford as the 14-handicapper shot 39 points. Shaun Popple and Joe Mennell were second and third respectively on 35. Len Newell completed a gross and net double in the fourth Winter Medal after the 12-handicapper came in with an excellent net 67. Samuel Overton finished second on 68, while Ray Lewis showed he still has plenty to offer by taking third prize on 70. Lawrie Worbey collected a very late Christmas present in the Seniors Turkey Trot at Staverton as he beat Paul Nightingale on countback in mid-January with 39 points. Northamptonshire’s Ryan Evans showed his game is in fine fettle at the start of the year as he produced a strong performance on his way to finishing 15th in the BMW Open in South Africa. Evans, who qualified for the European Tour after grabbing eighth spot on the 2017 Challenge Tour, struggled for consistency on day one as he bagged five birdies and seven bogeys in a 74. 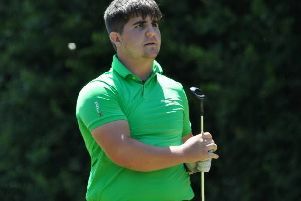 The Wellingborough pro turned it around brilliantly to make the cut with a 67, before surging further up the leaderboard with a remarkable third round of 68, which included three eagles. The 30-year-old, who got engaged over Christmas, remained in good spirits throughout the final day as he grabbed six birdies in a 69. County Girls team member Ashleigh Critchley received a late Christmas present as she benefitted from some one-on-one coaching with Robert Rock before playing a few holes of golf with the European Tour pro. With the Kettering golfer having won the prize with victory in the Robert Rock Junior Golf Tour last year, the day was originally postponed last month due to the snow. The Robert Rock Junior Golf Tour, which attracted players from across the county for their three events last season, are holding six regional tournaments in 2018. Young golfers of all abilities and ages interested in taking part are advised to contact Natalie Clark on info@robertrockjuniorgolftour.co.uk.